Eugene von Guerard, painter and teacher, was born in November 1811 in Vienna. From 1826, he toured Italy with his artist father and between 1830 and 1832 resided in Rome. From around 1839 to 1844, he studied landscape painting at the Dusseldorf Academy, and travelled widely. In December 1852, aged forty-nine, the Viennese-born German Romantic painter Eugene von Guerard arrived in Australia, hoping to find his fortune on the Victorian goldfields. His attempts were unsuccessful and he decided instead to resume his landscape painting practice. The natural beauty of his new homeland suited his search for the sublime and his desire to express the profound qualities of nature. 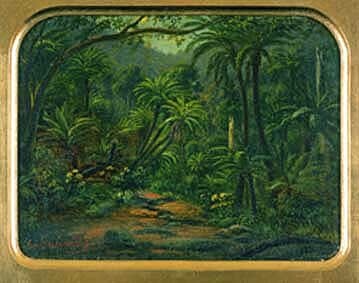 His understanding of the Australian bush and the topography of the land meant his paintings were more accurate than many of his contemporaries. He travelled wideley throughout Victoria and New South Wales, as well as to South Australia and New Zealand and gained regular commissions from wealthy landowners. In 1870 was appointed the first Master of the School of Painting, National Gallery of Victoria. He retired from this position at the end of 1881, and in 1882 departed for Europe. In 1891, he moved to London, and died in London on 17 April 1901. 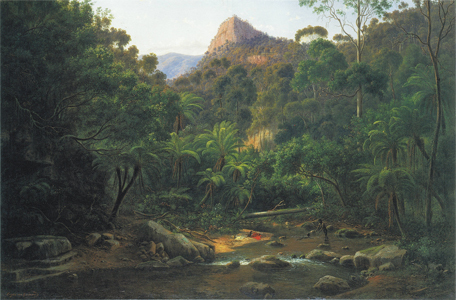 Von Guerard became Australia's most significant mid nineteenth century landscape painter and his work can be seen in most of the state galleries in Australia.